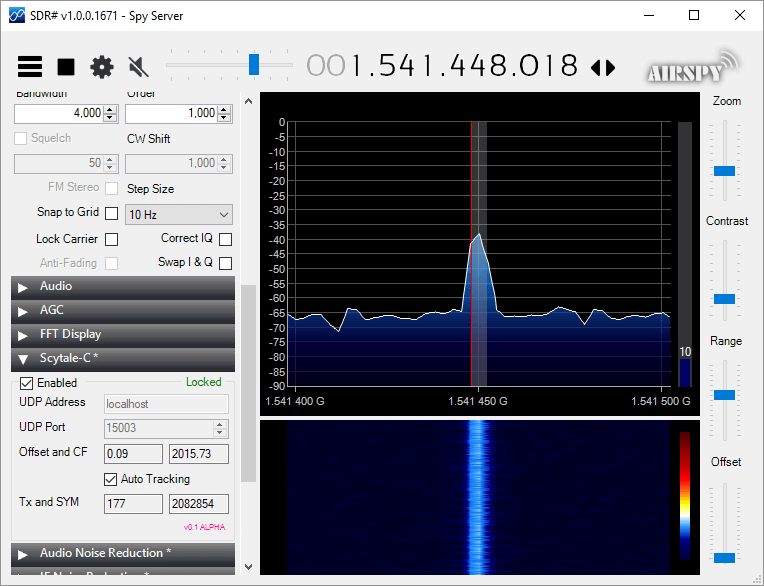 I ran it with SDR# version v1.0.0.1761. If it crashes you SDR# I apologize in advance. The auto-tracking (default on) will alter your SDR# frequency and follow the signal’s CF. When the SNR is very low, please disable it and manually tune the SDR# to try to get the CF as close to 2000 as possible.The demodulator still has plenty ideas of its own. Use USB mode with 4000 Hz bandwidth. For now the interface is missing the usual scatter plots. UDP Address and UDP Port are for sending the decoded frames to the Scytale-C UI. Offset and CF are the difference from zero error and the CF frequency of the demodulated BPSK signal. Tx and SYM are the transmitted over UDP frames and SYM is showing the number of demodulated symbols. A bunch of libraries are attached as extra files. Please be gentle and accept the package as it. Will clean-up in the future. The files can be downloaded from https://bitbucket.org/scytalec/scytalec/downloads. In a post uploaded last month we noted that Outernet was selling off some of their old L-Band satellite antennas cheaply. Nils Schiffhauser (DK8OK) decided to take advantage of the sale and bought one. Now Nils has created a blog post that shows how he's been able able to decode 12 L-Band AERO channels simultaneously with the Outernet L-band antenna, an Airspy R2 and SDR-Console V3. 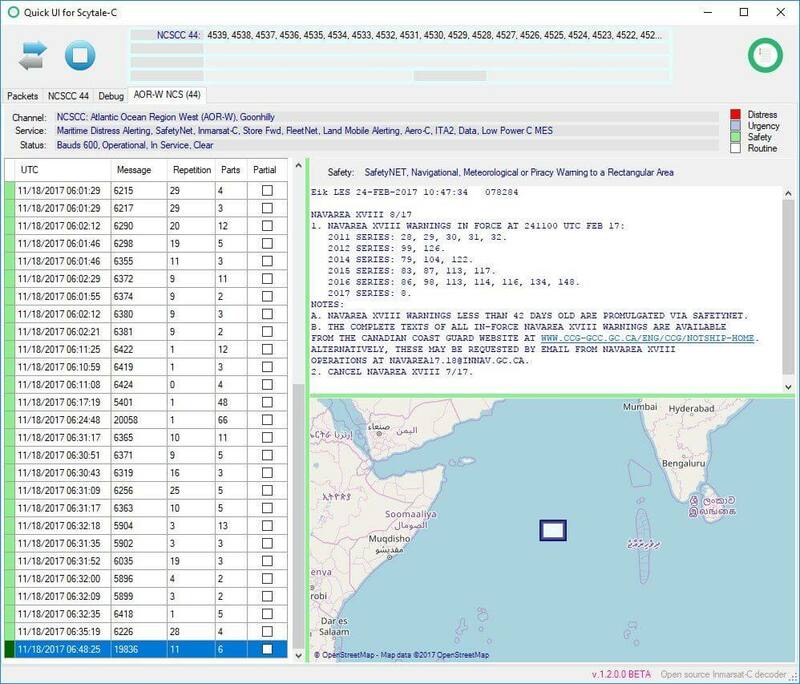 AERO is the satellite based version of aircraft ACARS, and it's L-band signals contain short ground to air messages like weather reports and flight plans. Multiple channels are often in use at any one time. To achieve this Nils uses the multi-channel tuning capabilities of SDR-Console V3, which allows him to open up 12-channels, each tuned to a different AERO frequency. He then opens up 12 instances of the AERO decoder known as JAERO, and then uses VB-Cable to pipe the audio from each channel into a JAERO instance. Nils writes that the key to making JAERO run with multiple instances is to install JAERO into different folders on your PC, and give each JAERO.exe a unique file name like JAERO_1.exe. He collects all the data into a program called Display Launcher and Nils notes that the whole set up has been stable digesting 54,000 messages over the last 24 hours. 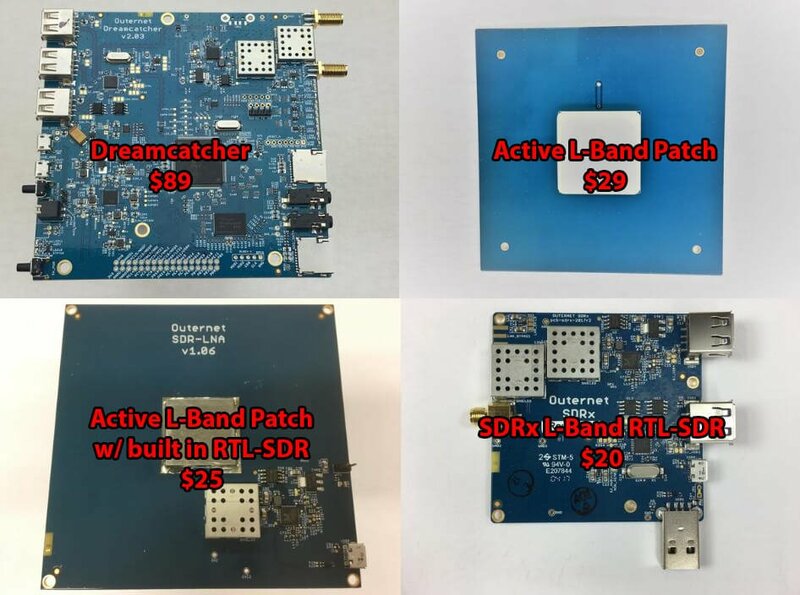 A few months ago satellite data broadcasting company Outernet created a limited number of prototype receivers that combined an L-band satellite patch antenna, LNA and RTL-SDR into a signal unit. This was never produced in bulk as they found it to be too noisy having the RTL-SDR so close to the antenna, but nevertheless it still worked fairly well. Over on YouTube max30max31 bought one of these prototype units and made a video about using it for receiving and decoding various L-band satellite signals. In the video he first shows an overview of the product and then shows it receiving and/or decoding some signals like Inmarsat STD-C, AERO and Inmarsat MFSK. The Tekmanoid EGC STD-C decoder was recently updated and a new commercial paid version was released. The paid version now supports the decoding of LES STD-C messages. Previously the only other decoder that we knew of which was able to decode LES messages was the www.inmarsatdecoder.com software. 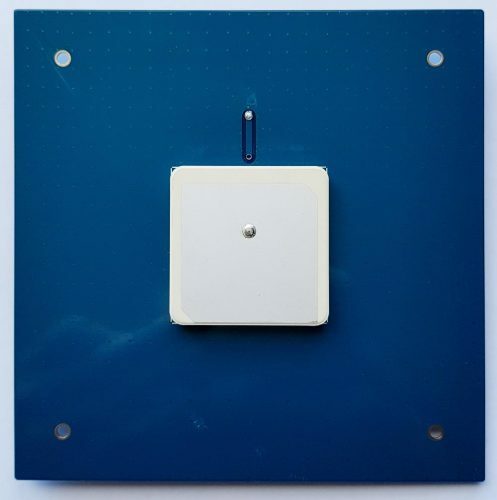 The inmarsatdecoder.com software costs €100, and while the price for the Tekamanoid decoder is not advertised, it is less than €100, and a bit more affordable for the average person. Tekmanoid STD-C Decoder Receiving LES Message. The free versions of both decoders only decode the EGC broadcast messages which contain SafetyNET messages. These include messages like weather reports, shipping lane activity and hazards such as submarine cables and oil rig movements, pirate activity, refugee ship reports, missing ship reports, and military exercise warnings. The paid version can decode the other non-broadcast private LES STD-C channels. 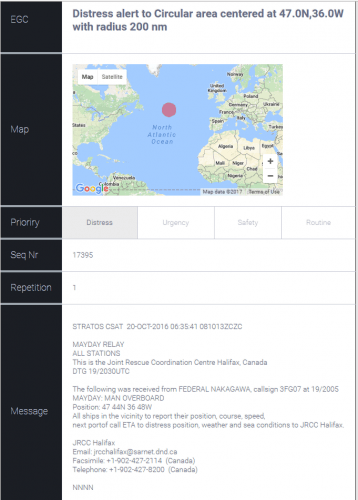 LES STD-C channels typically contain email like messages sent to and from ships. Mostly it’s company messages about the ship route plans, cargo discussions, repair/fault discussions, ship performance information and weather reports etc. Sometimes small files are also downloaded. Each Inmarsat satellite contains about 7 LES channels each run by a different telecommunications company, so one may be of interest to you. The paid version of the Tekmanoid decoder also has a nice feature for visualizing the SafetyNET EGC messages. Every now and then an alert containing coordinates and an area is sent out. Usually it is something like a distress alert from an EPIRB or the search area for a missing vessel. The decoder generates an HTML file that displays these areas on a map, alongside the text message. The author of the Tekamnoid software allowed us to test his new paid version for free. 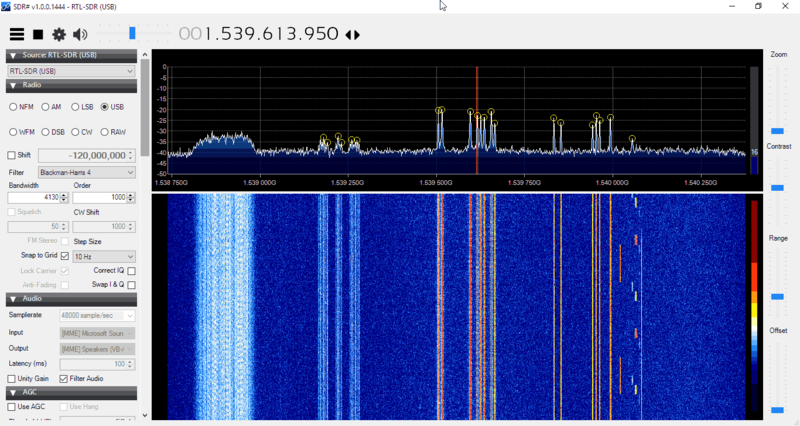 We ran the software using signal from an Outernet patch antenna and LNA. An RTL-SDR V3 + SDR# was used as the receiver, and the audio was piped to the Tekmanoid decoder with VB-Cable. 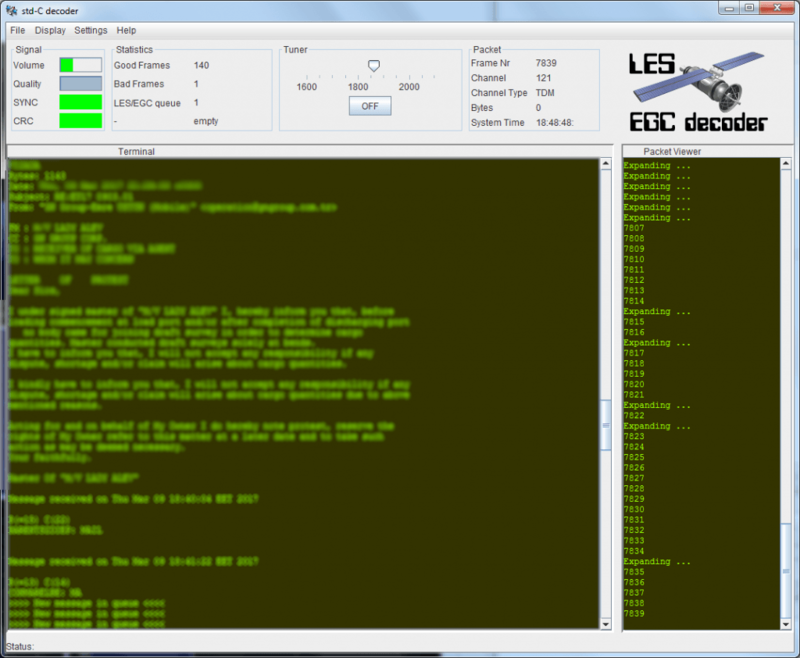 Decoding was almost flawless on both LES and EGC STD-C channels. In a previous recent update the Tekmanoid decoder was updated for improved decoding performance, and now in our opinion it is almost or just as good as the inmarsatdecoder.com software. If you are interested in learning more about decoding Inmarsat STD-C we have a tutorial available here. LES channels for the Inmarsat satellite in operation over your geographic location can be found on UHF-Satcom’s website. Remember that LES STD-C messages are not publicly broadcast, so in some countries it may not be legal to receive them. Most countries will have a law that says you can receive and decode the data, but you may not act upon or use to your advantage any information from the messages.